I have no problem giving brief synopses for spy dramas but my God the Bond films get a bit convoluted. Jumping from set-piece to set-piece with heavy action, random exposition and absurd plot holes, it can be rather tricky to summate exactly what the hell was going on. After the events of Skyfall, Bond [Craig] carries out a rogue operation in Mexico, which culminates in a building collapse at an extremely populated festival. With MI6 being merged with a government branch, Bond [Craig] is grounded by M [Fiennes] but continues his mission nonetheless. Building on the list of eliminated villains from Casino Royale to present, Bond uncovers a secret terrorist organisation called Spectre, run by a mysterious enigmatic figure [Waltz]. Tackling the positive elements, there’s a considerable amount of subtle layering and symbolism that ensures the Mendes Bond films are a step above their many predecessors. Instead of Roger Moore’s raised eyebrow and space adventures, we’re given a pleasing helping of emotional character development. Continuing the connection work in Skyfall, Spectre is more than a random sequel, it’s another layer of Bond’s armour exposed and peeled away. Another pleasant addition is the decent treatment of the ‘Bond girls.’ First we have Moneypenny who has been given more to do and makes a valid contribution to the story. Admittedly Monica Bellucci’s appearance as Lucia Sciarra serves as little more than a cameo but she’s the most sexual presence of the film and proves that you don’t need to rely on twenty something airheads to generate a sultry air. And finally, Seydoux as Dr. Madeleine Swann, who manages to be trained enough to handle herself, vulnerable enough to need Bond and clever enough to know the lifestyle has an expiry date. I mean, there wasn’t a great deal of chemistry between the actors but it’s somewhat forgivable. There’s nice use of simple humour without punning and quipping and Craig’s Bond has definitely found his stride in terms of how to execute comedic moments. As regrettable as this phrase is, the confident laddish banter works very well. Even to the extent that he doesn’t bother to dispatch a low-level security guard, opting instead to simply hold out his hand and forcefully command, “No! Stay.” Finally, the action is commendable and largely grounded, if verging on a fair amount of ludicrousness; being pummelled through the internal décor of a train without incurring a single bruise or broken bone, a small explosive watch that inexplicably causes an enormous chain reaction, that whole plane in the woods business. But all-in-all it works considering the overall nature of the type of film we’re watching. At the end of the day, much like the Marvel films, these movies are franchise action set pieces. As such, they forward the series while relying heavily on formula, call-backs and nostalgia. Skyfall closed having introduced us to Q, Moneypenny and brought back a male M in a wood-panelled room; everything about Mendes’ films tries to revive the tropes in a convincing and plausible way. And as I stated back in 2012, this is a problem for me. If the series ended with Skyfall it would bring everything full circle and work wonderfully. But here we are again with another sequel, this time with such heavy-handed homage work and series tickboxing that everything feels all too familiar. I will concede that Spectre addresses a lot of faults with the franchise, trying to rationalise and modernise the series even more but it’s still loyal to a fault. The villains always miraculously find Bond and vice versa and after they locate one another, nobody wants to just pull the trigger, leaving us with 60’s developmental nonsense like, “This way Mr. Bond. Would you mind surrendering your weapon?” “Why of course, it’s the gentlemanly thing to do.” We covered this with Austin Powers in the 90’s; it’s weird for murder-happy villains to pause when they’re about to win. Echoing his work in Skyfall, Thomas Newman has had his wings clipped and been confined to a distinct pattern, from which he must not deviate. Then there’s Sam Smith’s theme, Writing’s On The Wall which falters somewhat, failing to live up to the previous theme belted out by Adele. It’s not bad, it’s not going to go down like For Your Eyes Only and has a few soaring strings that work beautifully but overall it simply lacks majesty and presence. 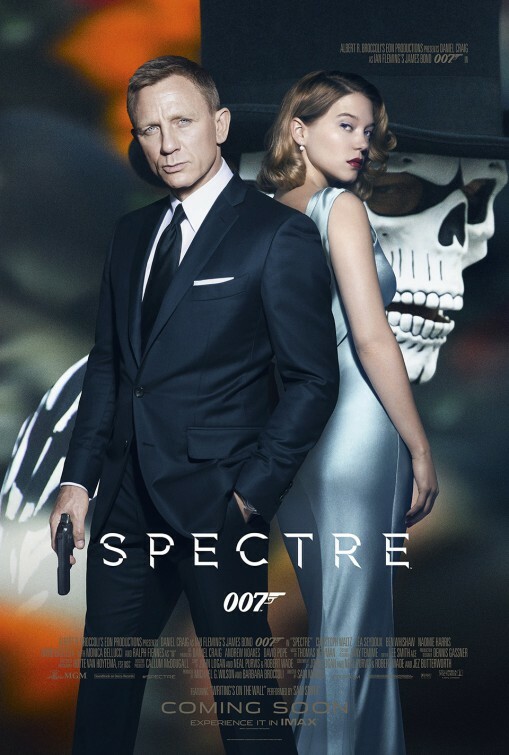 Staying with the technical aspects for a minute, Spectre is a very well-crafted film. The direction and editing are tight, the production design is noteworthy and the cinematography is very impressive. However, the pacing is pretty off. A fault with every single 007 release is the extremely bloated running time. These films are just far too long and with hindsight several action pieces or expository segments could have been cut entirely but are left in to keep the action/series quota on par with its predecessors. I still maintain these should be period films but Mendes and Co do a decent enough job of bringing the outdated intelligence agency into the modern era, highlighting this odd, misogynistic, arrogant relic of post-imperial Britain while noting the danger of monitoring and recording all information, like a Soviet controlled nation. The most interesting point presented by this film is the reaction it will instil in its audience. There are those who disliked and fought the grounded Bonds (Dalton/Craig), preferring familiarity and those who prefer the grittier aspects of this new flawed killer. Striking a bit of a middle ground, Spectre may feel too campy and throwback for its contemporary fans yet still too sombre for others; like Goldeneye. In truth, I doubt this is a swan song for Craig’s Bond and we can probably expect another instalment sometime soon; the quality of this work remains to be seen. With it massive scale, praiseworthy narrative drive, great camera work and captivating performance, Spectre’s opening sequence will be one that everyone will talk about. It’s entertaining, bold and masterfully executed. Having said that, it does resurrect an interesting niggle present in the last film: the Bond convenience hard at work again. I’m not necessarily referring to him falling through a building and landing on a sofa but the video that set him on that particular path. I won’t spoil anything but he’s out to assassinate a target based on intel that has neither supporting evidence or justification. Just, find this guy and kill him. How do I know this will help? Shut up, that’s how. Christoph Waltz is great but that’s really no surprise; if anything there wasn’t enough Waltz. Subsequently, I’d like to highlight Ralph Fiennes, who gives us a much more hands on M. Too often we were treated to MI6 being this hands-off department, disavowing knowledge of their own operatives; which is arguably realistic. Now we’re given a leader who follows in the footsteps of Judi Dench’s M and takes a much more active role, highlighting the hand-tying politics and bureaucracy working its way through the back channels, external to the excitement and peril of the missions. 1. What was the title of the prequel to The Thing, released in 2011? 2. 28 Weeks Later is the sequel to which film? 3. Which film depicts a photographer and an oncologist chained to a bathroom wall? 4. Who plays David, leader of the vampire gang, in The Lost Boys? 5. Which zombie film starred Woody Harrelson, Emma Stone and Jesse Eisenberg? 6. Scream was released in which year? 7. Which horror film did Stanley Kubrick direct in between Barry Lyndon and Full Metal Jacket? 8. What We Do In The Shadows is set in which country? 9. What was the title of the horror film Peter Jackson directed in 1996? 10. What is the name of the lead killer in The Texas Chainsaw Massacre? 1. What type of animal is Dumbo in the film of the same name? Elephant? Mouse? Whale? 2. The following is the poster tagline for which Disney animated film, “Join the merriest menagerie in the world’s best loved legend”? The Sword In The Stone? Robin Hood? Brother Bear? 3. What is the name of Ariel’s home in The Little Mermaid? Pacifica? Oceana? Atlantica? 4. What is the name of Cinderella’s stepmother in Cinderella? Lady Tremaine? Lady Phipps? Lady Felton? 5. Who voiced the role of Pumbaa in The Lion King? Robert Guillaume? Ernie Sabella? Jim Cummings? 6. Peter Pan was released in which year? 1948? 1950? 1953? 7. The following quote is from which film, “Don’t touch it you fools; might be poison. See? It’s witches brew.”? Snow White And The Seven Dwarfs? The Adventures Of Ichabod and Mr. Toad? The Black Cauldron? 8. The magic carpet in Aladdin is a mix of three colours. Which of the following is not one of them? Yellow? Green? Red? 9. When the fairies break Phillip out of Maleficent’s tower in Sleeping Beauty, they arm him with the Sword Of Truth and the Shield Of what? Justice? Righteousness? Virtue? 10. Mother Gothel’s dress in Tangled is styled centuries before the film is set, to emphasise how long she’s been alive. True or False? 1. The following is the poster tagline for which film, “The night he came home”? 2. Which film co-starred Tom Cruise and Brad Pitt? 3. According to Ringu how many years pass between Sadako’s death and the start of the film? 6. How many women make up the party trapped in the cave in The Descent? 7. 2013’s Warm Bodies is based on which Shakespearean play? 8. The Human Centipede is set in which country? 9. Pazuzu is the name of a demon in which film? 10. What is the name of the Nostromo’s computer in Alien? 1. How many people are murdered by Cesare in The Cabinet Of Dr Caligari? 2? 3? 4? 2. The following quote is from which film, “let’s head on down to the cellar and carve ourselves a witch”? The Evil Dead? Evil Dead 2? Army Of Darkness? 3. What is the name of the Other in Night Watch (?????? ?????) who has been imprisoned in an owl’s body as a punishment? Svetlana? Ilya? Olga? 4. At the start of The Birds, Mitch tries to buy a pair of lovebirds for his sister’s birthday. How old will his sister be? 11? 22? 33? 5. Which of the following is not a quote from the 2006 remake of The Wicker Man? What’s in the bag, a shark or something? We don’t commit murder here, we’re a deeply religious people? You little liars, Rowan Woodward is your classmate? 6. What type of building do Roger, Peter and the other survivors hold up in, in Dawn Of The Dead? Army base? Hospital? Shopping mall? 7. 2001’s Brotherhood Of The Wolf is set in which country? France? Spain? Ireland? 8. In Jacob’s Ladder, Jacob is a veteran of which war? Korean War? Vietnam War? World War II? 9. Which of the following films did not feature Vincent Price? The Invisible Man Returns? Cry Of The Banshee? Theatre Of Death? 10. Before settling on The Omen, Richard Donner’s 1976 film was originally called The Antichrist and The Birthmark. True or False? Set.. well.. it’s a little hard to tell how much time passes between the end of Hotel Transylvania and the start of Hotel Transylvania 2, especially considering we are treated to a rushed montage from wedding to the presence of a five year old child. So let’s skip straight to that. Mavis [Gomez] and Jonathan [Samberg] are happily married with their son Dennis, a half-human half-vampire child, although any sign of his mother’s genes seems either very latent or non-existent, much to his grandfather, Dracula’s [Sandler] chagrin. As Dennis develops, Mavis considers whether growing up around monsters is the right environment for her son, leading her and Johnny to take a trip to California to stay with Jonathan’s parents. During this time, Dracula and his friends embark on a road trip to bring out the child’s inner monster. So here’s the thing, Hotel Transylvania was surprisingly entertaining; not brilliant but not as terrible as I was expecting. Which was an unusual preconception to adopt as Tartakovsky has been producing amazing family projects for decades (Dexter’s Lab, The Powerpuff Girls, Samurai Jack, etc) and Sandler.. well he has his moments, albeit few and far between. Either way, it had a serviceable story, pleasing animation, decent enough jokes and was well performed. Then they announced a sequel that followed the Father Of The Bride story about a dad who can’t process his daughter growing up and worries how little of himself will be present in any future offspring. In this case, in a very literal sense: should his grandchildren be carrying on the vampiric line? Much like its predecessor, Hotel Transylvania 2 gets a lot of things right. Most importantly is the positive progressive message about mixed marriages and coming to terms with the nature of what family is; that is, until the end of the film but I’ll expand on that in my highlighted scene section. The humour once again excels best when it plays on the mythology and iconography of the respective legendary characters – I rather liked the fact that Mavis wants to move to Santa Cruz (where The Lost Boys is set) though I have no idea if that was intentional or not. But everything outside of that is incredibly difficult to praise without adding caveats prefaced with “as long as you ignore”. One of the biggest irksome points is Sandler’s entourage. Ok, that may be a bit of an exaggeration, really I’m just talking about the deplorably unfunny David Spade. But Sandler authoring the script presents a great deal of weak comedy elements that could have been altogether avoided. Having said that, this was released in the same year that Sandler also penned Pixels, so it’s worth noting that it could have been so much worse. The trouble is there are too many sight gags, dance sequences and random ukulele songs that have no business being there, other than to babysit the youngest members of the audience. You may assume that means I’m not a fan of the slapstick, far from it, I find that decent slapstick is the backbone of cross-generational family humour but what this movie forgets is that it needs to be original and avoid the ubiquitous. And while we’re on the subject of tropes, there was an excessive amount of odd cartoony inclusions that felt a little trite. I understand Dracula is an overprotective father who doesn’t want to lose his daughter (pretty much the plot of the first film) but to prevent her kissing her new husband at the wedding is a touch disproportionate, especially when you consider the manner in which he celebrates when he realises he’s going to be a grandfather (and what was up with that reveal? She has her usual physical appearance, even in bat form, then she hides in a cloud for a minute only to reveal a hugely pregnant stomach?). It may sound petty but it’s this overall reliance upon simple and tired developments that hinders the film from saying anything of note. 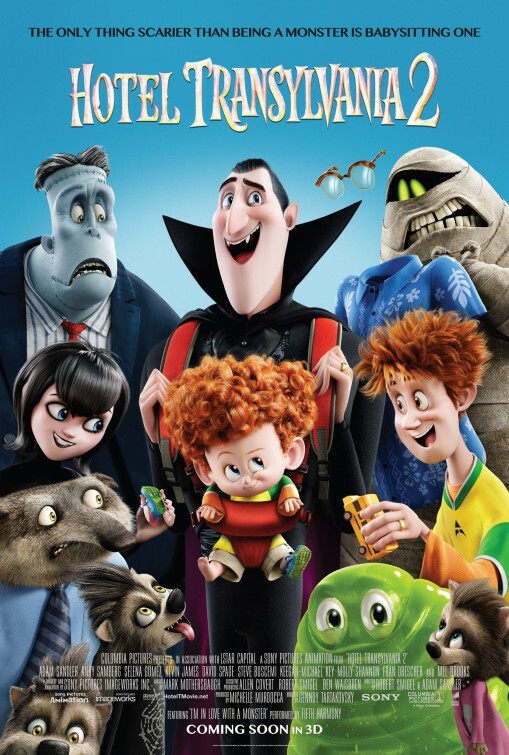 Hotel Transylvania 2 is just as inoffensive as the first one but this time round feels like the two dimensional nature of the characters will all-too-quickly outstay their welcome, especially without solid, original storytelling. And in truth, they will always falter when held up against things like ParaNorman or Coraline and completely fails when compared to anything produced by Pixar. Strangely, the best comparison I could draw would be the Kung Fu Panda films. Kung Fu Panda has a great, effective story, a brilliant setting, vibrant visuals, a thundering score, energetic voice acting and possibly most importantly an overwhelming love for the genre it’s both homaging and lampooning. I know we all claim to know and love classic monster movies but so few people have actually seen the originals and therefore a lot their conceptions about them are based on inaccuracies. As they stand, two Hotel Transylvania movies are fine, perfectly acceptable in their own right. But if a third is released, I would definitely expect a significant drop off in the rate of appeal. Hopefully it won’t come to that. After all the build-up about the kid’s heritage and Dracula having to come to terms with loving his grandson unconditionally that’s all pissed away when it turns out Dennis is a vampire. I know they call him half-this half-that but no, he’s a vampire, he has fangs and can fly and fight and see great distances and hypnotise things and instantly masters all of his genetic abilities with exceptional ease. This really annoyed me. Ten years ago Spielberg directed War Of The Worlds and while it wasn’t perfect, it had the ability to be amazing, most notably because the narrative openly called out Tom Cruise’s character, by highlighting that he had no plan, he was just going to dump the kids off with their mother. But as the film progresses, you realise that everyone’s probably dead and even if they are alive, he’s going to have to explain how he got one of them killed. Grounds enough for a great writer to produce something brilliant, I’m sure you’ll agree. Instead, everything worked out fine and no one learned anything and the same thing happened here. So much fuss is made of Dracula’s pressuring and his father’s flat-out racism that a moment of real strength of character would break forth any minute. But then they abandon it for a poxy fight scene and suddenly no one has to adjust and everything just carries on as per usual. As with the first film, I found Dracula and Frankenstein to be the most pleasing characters portrayed by both Adam Sandler and Kevin James in years. Channelling decent comic talent without resorting to the usual standard gimmicks that both of them fall back on all too often. I would want to talk about Mel Brooks and Rob Riggle but they appear so late in the film that they feel like an afterthought. Some would posit that there are two Del Toros; the director of Pan’s Labyrinth and the man who made Pacific Rim. Whenever a new release is announced, people wonder whether the fanboy or the visionary will be at the helm. I wouldn’t say I entirely agree with this dissociative identity disorder diagnosis but I will acknowledge that Crimson Peak feels like the exact midway point between emotional period suspense and style over substance. Young, independent and headstrong, Edith Cushing [Wasikowska] is not the typical heiress to a self-made nineteenth century industrialist. She has a keen penchant for writing and a fascination with ghosts, following the death of her mother. One day a young man from England, Sir Thomas Sharpe [Hiddleston], arrives in New York, seeking investors for clay extraction from his land. Despite her father, Carter Cushing [Jim Beaver] rebuffing the investment, Edith falls in love with Sir Thomas. Unhappy with the union, Carter hires a private investigator to dig into the past of Sir Thomas and his standoffish sister, Lucille [Chastain]. At this point if I go any further with the synopsis, I might as well tell you the story, so we’ll just leave it there. The story openly acknowledges, with its own internal parallel, that this is not a ghost story but a story that happens to contain ghosts. A closer categorisation would be gothic romance, a genre which has been long since absent from our screens. For those who don’t know, gothic romances are grounded horror stories that focus heavily on “feminine perspectives,” sometimes with supernatural elements, sometimes not. Crimson Peak is very much an homage to 1940’s adaptations like Rebecca, Gaslight and 1999’s Sleepy Hollow, with the added bonus of a rather mature understanding of ghost lore. By that I mean, the ghosts are of course used to scare the audience but their presence makes sense and is almost justified by horrific actions and physical keepsakes – without wanting to spoil too much. Unfortunately, this grounded reality serves to hinder the denouement but I’ll expand on that later. As with every single Del Toro flick, the production design is astounding. The costumes are lavish and flamboyant while also being completely period-plausible, the sets are swelling with detail and the cinematography evokes a strong emotional colour palate without being heavy handed. I must confess, the cinematography was one area of concern going into the film, as I think Del Toro’s work with Guillermo Navarro has yielded nothing but spectacular results but Dan Laustsen’s history with the horror genre (and Del Toro himself) proved him more than capable of meeting Del Toro’s distinctive visual style. Furthermore, there are plenty of clues laced throughout the set design and narrative that illustrate how the film will end which demonstrates a purpose driven decorative style, rather than the slapdash “plonk that in because it will look good enough” mindset that all too many period horrors rely on. Leaving the cinema, I couldn’t help but feel a little riled. It’s not a bad film but the finished piece felt somehow beneath Del Toro; very much a middling effort devoid of real impact. As stated, the film is visually pleasing (even if a few of the CGI effects’ reach exceeded their grasp) and the sound design is wonderful but the narrative is a little worn and trite. 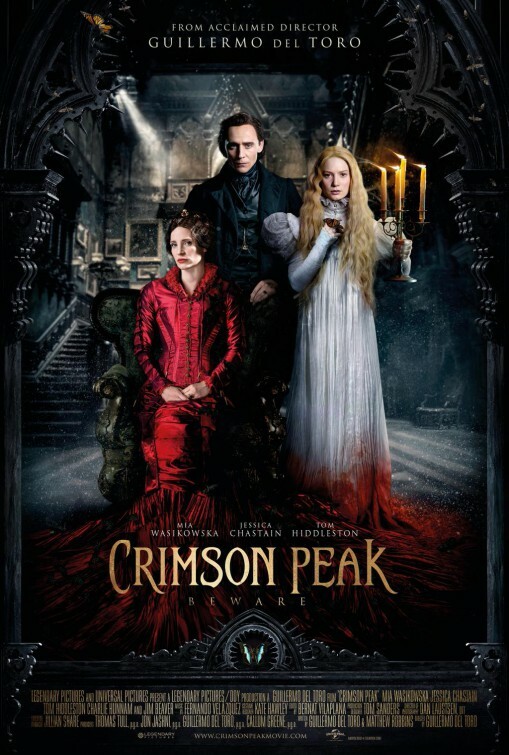 The truth is, if you haven’t seen a lot of gothic romance/horror or aren’t familiar with the classics then Crimson Peak will be a far greater source of entertainment for you. To my mind it felt akin to a remake of a foreign language hit. All the notes and elements were in place but retreading familiar ground produced a slightly disappointing lacklustre effect. Again, it’s not that Crimson Peak is a bad movie, I’ve just seen far superior versions and while Del Toro has referenced and recreated them with tender care, he hasn’t really produced anything new or innovative. On top of that, after an hour and a half set up, the final act feels somewhat rushed. Obviously as key information is revealed the plot has to spool faster and faster to a conclusion but in doing so, it made the build-up seem plodding and bloated in hindsight. The final chase is brilliantly tense and with all of Chastain’s coiled rage unleashed in full shrieking glory, it’s a haunting and gripping finish. What’s more, it’s very refreshing that a film with two strong female roles doesn’t end up with one of them being saved by a man (well, not entirely); ensuring Wasikowska’s Edith remains a pleasingly strong and capable individual from start to finish. Having said that, with the supernatural taking a backseat the final third feels a touch unsatisfying and anti-climactic. And yet the more I think on the film, the harder it is to say exactly where it puts a foot wrong. At the end of the day, it comes down to personal enjoyment, which in turn relies heavily on your own understanding, appreciation and knowledge of the greats that have paved the way for and inspired this release. Regular readers will know I’m not a fan of horror. But that’s not entirely accurate, I just don’t like jump-scares. Violence, gore, suspense, they’re all arguably fine, it’s just the extremely abrupt loud noise accompanied by a flash of bright or gruesome imagery that I have problems with. Interestingly, while this film has plenty of jump-scares, it focuses more on maintaining an eerie atmosphere. And everything that takes place within Allerdale Hall is masterfully executed – possibly owing to the fact that the entire manor is an actual working set, rather than a series of unconnected rooms and green screens. People have been raving about Jessica Chastain for a while now and I’ve not got it. This can happen with a lot of rising talent, they just overwhelm every release and you’re expected to appreciate them for the wonders they are. Some become iconic (Tom Hardy) while others highlight their limited range (Sam Worthington). Chastain had yet to prove herself to me, so I couldn’t make my mind up. I admit she’s very capable and was impressive in The Martian but nothing standout. Until now. This is the film where I finally get it. I wouldn’t say she’s had a chance to really open up as an actor with her previous releases but the passion, madness and fury demonstrated here is just sublime. I can’t praise her highly enough. You Gotta Be Stogin’ Kidding! Genre – A quiz team suspect their quizmaster may be more than he seems..
1. Scarface is a modernised remake of which 1932 film? 3. Fozzie Bear, Gonzo, Scooter and Bunsen Honeydew are characters in which franchise? 4. Ben Stiller and Cameron Diaz first co-starred in which film? 5. What is the title of Will Smith’s only Western to date? 6. Spielberg’s The Terminal depicts Viktor Navorski confined to an airport in which US city? 7. What is the name of the possessed girl in The Exorcist? 8. A League Of Their Own is about which American sport? 10. What is the subtitle to the second Captain America film? 1. Jeff Bridges starred in which John Carpenter movie? Christine? Starman? Prince Of Darkness? 2. Halloween was released in which year? 1976? 1978? 1980? 3. In They Live, what items does John find which allows him to see how the world really is? Goggles? Binoculars? Sunglasses? 4. How many times have John Carpenter and Kurt Russell worked together on feature films? 4? 5? 6? 5. Assault On Precinct 13 is an homage is two films. Which of the following is not one of them? Rio Bravo? Night Of The Living Dead? The Misfits? 7. What is the name of Jack Burton’s truck in Big Trouble In Little China? The Pork Chop Express? The Orient Express? The Marco Polo Express? 8. What is the name of the sunken ship in The Fog? Anne Nord? Elizabeth Dane? Mary Fin? 9. How many Americans reside at the Antarctic research station in The Thing? 9? 12? 15? 10. Escape From New York is Kurt Russell’s first and only writing credit. True or False? 3. Who directed RoboCop, Starship Troopers and Black Book? 5. What is the title of Christopher Nolan’s feature debut? 6. Which film starred Michael Douglas, Josh Brolin, Dennis Quaid, Viola Davis and Salma Hayek? 7. The following songs featured in which film: Just Around The Riverbend, Listen With Your Heart and Mine, Mine, Mine? 8. In Looper, who plays Abe, the gangster sent back from the future to manage the eponymous loopers? 9. The following is the poster tagline for which film, “They call themselves ***. The secret caves, the old lighthouse, the loot map, the treacherous traps, the hidden treasure. Join the adventure”? 10. The following quote is from which film, “Old McDonald had a farm, ee-ey-ee-ey-oh and on that farm he shot some guys bada bing, bada bing bang boom”? 1. What are the codenames for the Command Module and Lunar Module in Apollo 13? Columbia and Eagle? Odyssey and Aquarius? Endeavour and Intrepid? 2. In Finding Forrester, William Forrester (played by Sean Connery) is an author who won which prestigious award? Nobel prize? Pulitzer prize? Booker Prize? 3. Which of the following did not star in 1990’s Memphis Belle? Sean Astin? Ron Livingston? Billy Zane? 4. Jonesy, Beaver, Pete and Henry are the lead characters in which Stephen King adaptation? Thinner? Dreamcatcher? Stand By Me? 5. Michael Keaton and Nathan Fillion play which role respectively in the 1993 and 2012 adaptations of Much Ado About Nothing? Leonato? Dogberry? Don Pedro? 6. Which Universal Monsters film is set in Wales? Creature From The Black Lagoon? The Wolfman? The Invisible Man? 7. Who plays the title role in 2004’s The Life And Death Of Peter Sellers? Dustin Hoffman? Geoffrey Rush? Steve Coogan? 8. Which actor’s real name is Thomas Mapother? Tom Hiddleston? Tom Cruise? Tom Hardy? 9. Which of the following categories did Robert Rodriguez not receive a credit for on Sin City? Cinematographer? Art Director? Composer? 10. The musical score for Disney’s Sleeping Beauty features excerpts from Tchaikovsky’s ballet, Sleeping Beauty. True or False?